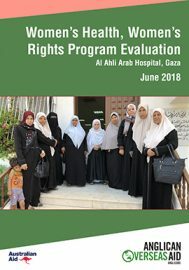 The Women’s Health Women’s Rights (WHWR) Program is implemented by the Ahli Arab Hospital in Gaza. The current iteration of the project has been running since 2009, funded through the Australian Government’s Australian NGO Cooperation Program (ANCP) (since 2011) as well as from donations from Anglicans in Australia. This program is continuing from December 2018 under the name Women’s Health and Well-being with some new emphases. The goal of the project is to improve survival rates of women with breast cancer in Gaza and reduce stigma associated with the disease. Current survival rates for breast cancer in Gaza sit at around 40%, compared to around 85% in Australia. Women also often suffer from significant rejection and social stigma. This evaluation shows the vital work that is being done through the WHWR Program, positively impacting the women who receive health support as well as the wider community. Despite operating in a very challenging environment and having a long way to go in changing community and male perceptions of the disease, the program is seen as indispensable and delivers impressive results.